My little boy is growing up in an age of technology. 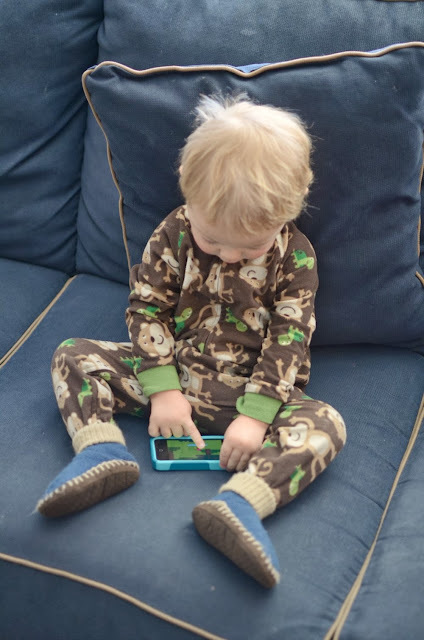 I didn't want him to know how to operate an iPhone before the age of 2, and I didn't want him to have those types of words in his vocabulary shortly after. It all started with our trip to Disney when I knew the plane ride would require diversions of every kind, and that included the iPhone. He now gets a little screen time a few times a week, but only because he sees the phone out and asks so kindly by saying "pease" and signing it with such excitement and determination. He first enjoyed playing peek-a-boo barn on the phone, listening to all the animals, acting surprised when the bard doors opened. Now all he wants is Forest Flyer, or "bird", and to fly that little bird around the screen.